There is usually a clear dividing line between plastic kit manufacturers (like Tamiya) and toy producers (like Hasbro). As far as I know, Tamiya has never produced a toy and Hasbro has never produced a scale model kit. But some companies make both kits and toys. Bandai, Aoshima and Takara Tomy fall into this category. The quality of kits produced by these firms tends to be less consistent than you’d find with a dedicated kit manufacturer. This isn’t surprising given that their primary target market is children. It goes without saying that five-year olds have a vastly different set of criteria than adults do when it comes to hobbies. Some five-year olds like to put their prized possessions in the sandbox. Others like to chew on them. I’ve yet to see any adult modellers taking part in either of these activities (if you know an adult fitting this description, please take them to a psychiatrist immediately). Takara Tomy recently introduced both a large toy of Thunderbird 2 from the new Thunderbirds Are Go TV series, as well as a “Real Kit” of the same subject in 1:144 scale. The former product is aimed squarely at five-year olds. It features opening sections, moving parts, a detachable pod with Thunderbird 4, and built-in sounds. This seems to be a well thought out product which kids should like. 1. The kit is hard to distinguish from the toy. In fact, eBay listings for the two products are so similar that it’s hard to tell one from the other. 2. It is a snap together kit with a choice of stick-on markings or waterslide decals. These features indicate that the product is aimed at novice modellers. 3. Like the toy, the kit features a removable cockpit roof. This creates a huge gap at the bottom of the roof and ruins the scale look of the kit. Authenticity was obviously not a priority in the design of the kit. Considering these compromises, it’s clear that Takara Tomy rejected the idea of a serious scale replica. Instead, the company attempted to create a product that would appeal to both children and adults. This was a mistake for two reasons. First, the Real Kit is not sufficiently different from the toy in price or appearance. This may result in the two products cannibalizing each other’s sales. Second, the Real Kit was designed under the assumption that most Thunderbirds Are Go viewers are kids. This fails to take adult viewers into account, who grew up with the original Thunderbirds series and are now enjoying the new reboot as a trip down memory lane. Many of these returning viewers are experienced modellers willing to pay top dollar for authentic kits of their favourite subjects. They have fond memories of the original Thunderbirds series and still admire all its wonderful hardware. Takara Tomy would have been much wiser to follow the example of FineMolds, whose Star Wars kits set a new standard in quality for sci-fi subjects. Their enormously successful 1:72 Millennium Falcon which I discussed here is a case in point. The FineMolds Falcon was a rarity: a mass produced, high quality sci-fi kit aimed squarely at experienced modellers, with no compromises made to attract younger modellers. In addition to compromising the quality of their kits, companies like Takara Tomy, Bandai and Aoshima also do a disservice to modellers by associating kits with toys. This tarnishes the image of scale modelling. Buying a kit from one of these companies is a bit like buying a stereo from a guy with a van parked in an alley. 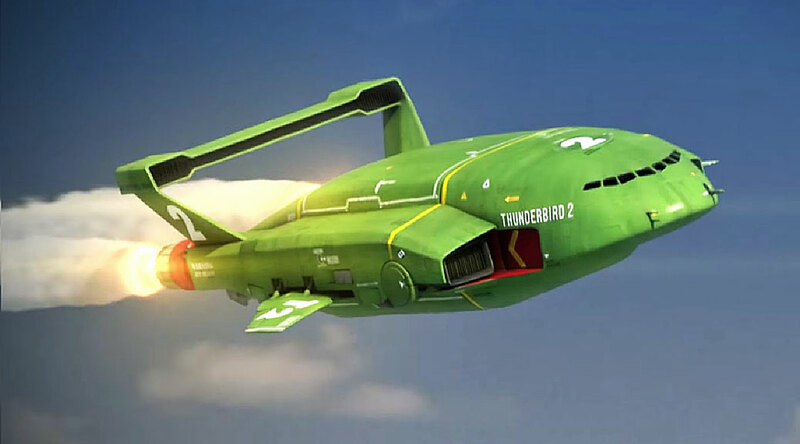 But at the end of the day, having an average quality kit of the new Thunderbird 2 is better than nothing. Given the relatively low demand for sci-fi kits, we have to take what we can get. So if you decide to pick up Takara Tomy’s new Thunderbird 2, be prepared to do some extra work to get it up to standard. The basic shape of the kit looks accurate enough, and most of its shortcomings can be overcome with a little care. Just make sure to throw out the stickers. Or even better, mail them back to Takara Tomy with a note stating that scale modellers don’t use stickers!